Solidarity to the rising egyptian and arab world. We support tomorrows demonstration of the egyptian people towards the embassy of Egypt. We will gather tomorrow, FRIDAY (04/02) 1:45pm at ''OXI'' roundabout. On Sunday 31st January 54 year old Khalid Mahmood was killed when the Immigration police invaded the house where he lived with three others. Khalid, an immigrant without papers from Pakistan, fell from the first floor when he tried to get away from the police trying to arrest him. He was seriously hurt and the next day in the hospital he died. Things like this happen many times in Cyprus, even if it's rare that they end with someone's death. Because he was an immigrant without papers, and because in the 'democracy' we live he is considered 'illegal', he preferred to risk his life rather than lose his freedom. Today immigrants without papers live terrorized by the threat of arrest and deportation. They live like they are not human like the rest, like they do not have the same rights. At the same time they are exploited by Cypriot bosses who pay very low salaries for jobs with inhuman working conditions. But everyone knows that the police does not invade the houses of the bosses. They terrorize only the weakest and the most unfairly treated, especially the immigrants with no papers. This situation is to the bosses' advantage, who become richer from unofficial work and the separation of immigrants into 'illegal' and 'legal'. The worldwide system which is to blame for the poverty and oppression in countries like Pakistan is the same worldwide system which protects the bosses and terrorizes the workers here in Cyprus. We stand in solidarity and unity with all oppressed people because it is the only way we can self-organize and resist this system. To the International Indymedia network. 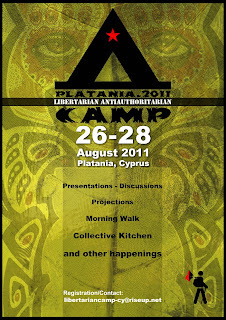 We’re sending this letter as groups from the anti-authoritarian, anarchist, libertarian and anti-racist community in Cyprus. We want to confirm the fact that “indymedia” CYPRUS is controlled by a few people who have nothing to do with the grassroots community of the island. Unlike, the cyprus “indymedia” is used to attack events of the community either they are anti-fascist, anti-racist, anti-nationalist, either defending the right for public space or creating alternative structures, such as a library etc. The lying and conspiracy theories that the administrators are creating are easily perceived by anyone. On the other hand their attitude towards nationalist groups is friendly. They advertise nationalist events through the webpage under the pretext of their “anti-occupation struggle” and contrast towards a federal solution in Cyprus. 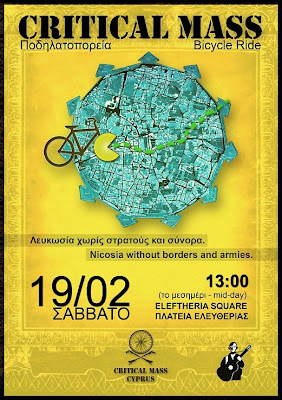 (Even a few days ago they where advertising an event organized by a far right students group of the university of Cyprus ( http://epalxi.net/), which is friendly with ΔΡΑΣΙΣ-ΚΕΣ, another far-right group which supports Cyprus to be controlled by Greece. We believe that Indymedia is a conquest of the libertarian anti-authoritarian movement and that the specific case of Cyprus Indymedia is a glaring dissonance. We expect that the dialogue which began in this context will soon have results and that the blog which is presented as Cyprus indymedia on your lists will be deleted. For any other information you need to make a decision we are at your disposal. Let’s clarify a few things: this term (Greek – Christian ideal) was invented with the founding of the Greek state, and does not correspond to historical reality. There was no smooth continuity of ancient Greece into byzantine orthodoxy, but a full-on clash of the two different cultures, leading to the prevalence of one. So Greek flags depicting Cyprus and the Parthenon, alongside flags of Byzantium can only be described as an awful collage of nationalist propaganda. The invention of the ‘Great Idea,’ – result of the last process – served the local bourgeoisie in the extension of its political dominance to the total of lands where Greek-speaking cultures lived (1912-1922). All of this proves that nationalism, as an ideology, exists to serve certain interests of the ruling class, in subjugating those under them. This Thursday night 14/10, homes of residents, shops, workshops and our office,located on Sapfous street within the walls of Nicosia, once again were the target for another fascist attack from nationalists.This time, the neonazis of the of the organization in greece called Golden Dawn and its cypriot branch E.LA.M, starting from the coffee shop "Kala Kathumena" sprayed-painted the walls with slogans, such as Nazi symbols, "if we want we can burn you»(! ),long live the nation, Greece - Cyprus - union, etc. We know that our presence as anti-authoritarians in the region and our clear and honest anti-fascism causes this violent reaction of the neo-fascists, but at the same time, our presence in the region has brought social debates, concerns and prospects of resistance. We will not sit idle in front of the fascist challenges, we will respond to the nationalists / racists with solidarity, direct action and the self-organization of society.